Who are Friends of Crystal Palace Dinosaurs? Friends of Crystal Palace Dinosaurs is a charity registered with the Charity Commission for England and Wales (no.1165231) whose purpose is to promote the long-term conservation of these statues and the larger geological site. We don’t own the statues, and we don’t control access to the site. Instead, we keep a close watch. We work with the owners (London Borough of Bromley), custodians of the park, other charities, and key national organisations (such as Historic England) to ensure the dinosaurs get the care and attention they need. Our aim is to ensure the dinosaurs survive our generation intact, so they can be enjoyed for future generations. We also care deeply about public engagement. Everyone loves the Dinosaurs, and the site is as alive visitors today as when the park opened in 1854. The Friends develop engagement programmes, give public lectures, encourage visitors to do more than take a few quick photographs, and help school children think about the importance of science in their daily lives. We particularly aim to provide resources that will encourage others to draw their own meaning from the site. A key part of engagement relates to history and heritage. The Victorian story of these statues is one that fascinates all who encounter it. Yet, there is much that still remains a mystery to the historian. The Friends are working to unravel some of that narrative. More important, the Victorians weren’t the only people to encounter the dinosaurs. What about the rest of us? No walk through the site seems to go by without hearing stories and memories from visitors. Whether it’s families on a picnic, or dog walkers, or couples relaxing, or grandparents sharing a story from their youth, visits to the dinosaurs form part of life for thousands of people every year. The Friends works to capture some of those encounters so we can preserve them for the future. Of course, two things need to be said about the Friends. First, we use the term “dinosaurs” in deliberately loose fashion. Of the 30+ statues, only 4 represent dinosaurs in the strict, technical zoological sense of the word. The statues also include pterodactyls, plesiosaurs, mammals, crocodilians, and amphibians. We count those, too. We also include the many geological displays and the related landscaping in the vicinity of the tidal lake in Crystal Palace Park. And, don’t forget the plants! All together the whole site seems to be what most people think of as “the dinosaurs,” so we follow suit. Second, Friends of Crystal Palace Dinosaurs don’t work alone. Crystal Palace Park is an enormous space, with many attractions. And, there are a variety of groups working as advocates in one way or another around the park. Some focus on particular elements, such as Crystal Palace Subway. Others cover the broad interests of the park and its history, such as Friends of Crystal Palace Park and Crystal Palace Foundation. We work in partnership with these like-minded groups. In modern parlance, we are all “stakeholders”. In fact, park managers operate various “stakeholder” committees, and Friends of Crystal Palace Dinosaurs contributes where we think we can be of use. Friends of Crystal Palace Dinosaurs started in 2013. When we began, we were a small group of local residents living near the park. We saw the dinosaurs slowly declining due to lack of maintenance. We saw vandalism. We saw how hard it was to find simple, clear interpretation. In talking with those who work in the park, we also heard stories of declining resources and declining commitment. After a harsh winter hit the statues particularly hard, we decided it was time to do something. That’s when the Friends came together. Since 2013, we have been quite busy. Word is spreading about the needs and about our work. We worked with officials from English Heritage and from London Borough of Bromley. We lobby. We campaign. We worked to secure funding. We’ve built a strategy plan for action and a management board to guide activity. Our community is growing quickly. Follow us on Facebook and Twitter, too. The dinosaurs need a lot of care and attention. This is going to be a long journey. 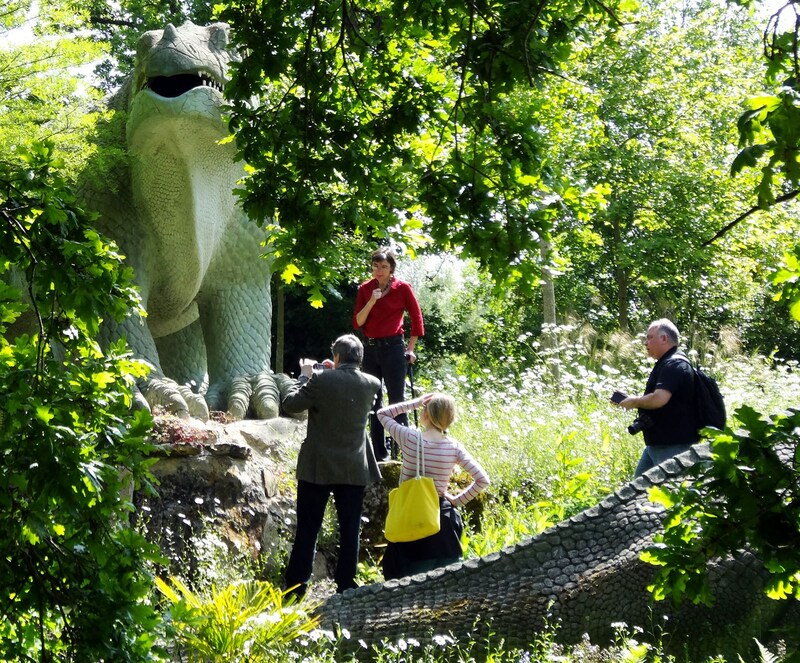 Friends of Crystal Palace Dinosaurs examine one of the Iguanodon statues during a visit with English Heritage and Bromley officials, May 2014. We pointed out some of the main risks to the displays. Can we give you access to the dinosaurs? No. We don’t own the dinosaurs. Everybody does – they are a heritage asset owned by the public. London Borough of Bromley is their legal custodian. Also, we do not control access to the geological islands – the Borough does, and this is delegated to the Park Manager. Filming access is organised through FilmFixer.